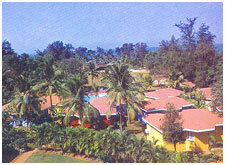 Teen Murti, Fatrade, Varca, Salcette, Goa - 403 721. Access : 27 kms from Golden Sand, 45 Mins. from the Dambolim Airport. 24 hrs. Room Service, Safe Deposit Lockers, Foreign Exchange, Baby Sitters, Laundry Service, Shopping Arcade, Doctor-on-Call, Children's Park & Outdoor Games, Tennis Court & Beach Volley Ball, Indoor Board Games, Swimming Pool with a separate Pool for Toddlers, Satellit TV with Channel Music and Telephone, Bicycle and Vehicle Rentals.